I'm not making the text white because the cap logo isn't white. It wouldn't be consistent. Any more comments before I post the update? These keep getting better and better. The jersey are amazing and the fields are so great, they inspired me to make my own fields for my concepts. So thank you! And I can't wait to see what is to come. Thanks, I took a look at your field and it's really well thought-out! I'm glad you liked the template. I would post the update to the logo sheet but my Photoshop isn't working as I mentioned in the General Design forum. If you've got an answer to that question, please share because certain teams down the road won't come out unless that's resolved. Look for team 4 tomorrow, this is another one you've seen in the last go-around. Better late than never, right? I'm still battling damage issues with photoshop, so if you've got any tips give me a hand. Born in 1979, the New Mexico Suns are another team who have yet to raise the Branson Cup, but they’ve come very close to doing so. Oh so close. In 1983, the Suns snuck in as a second wild card team, beating Pittsburgh in a play-in game for the second spot. They won the game with a walk-off double by Owen Soto and paraded their way all the way to the Championship Series against Iowa. The teams split the first 6 games before playing the ultimate rubber match in Des Moines where the Suns were heartbroken when they were walked off themselves. Boris Beckman pitched a gem for the Suns, who had a 7-3 lead in the 7th, but the bullpen let the game unravel. Vito Steel was the man of the night for the Dusters, hitting the solo homerun in the 13th to win 10-9. Unfortunately for the Suns, that 5th season in existence was the closest they’ve ever made it to a title. Going into the season, it looks like a wild card is their best shot at contention, but even that could be a stretch. Ricardo Hernandez and Rob Barajas are both fine sluggers for the club, but both are widely seen as trade bait for teams in legitimate contention. Perhaps the lone reason they’re still in the Land of Enchantment is because of their inability to stay healthy, which is a red flag for other teams. 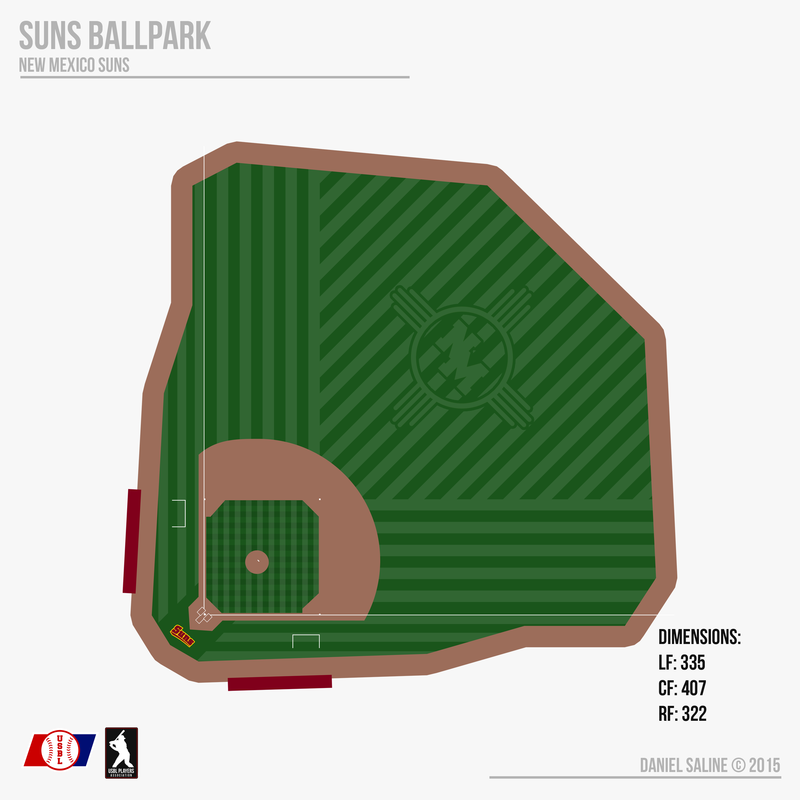 The thin air and short porches make Suns Ballpark one of the more homerun-friendly stadiums in the league. Perhaps that’s the reason Hernandez and Barajas put up gaudy numbers in the past, but New Mexico fans will surely tell you otherwise. Built in 2006, the park is brand new and is in top notch shape and looks like it could be around for decades. 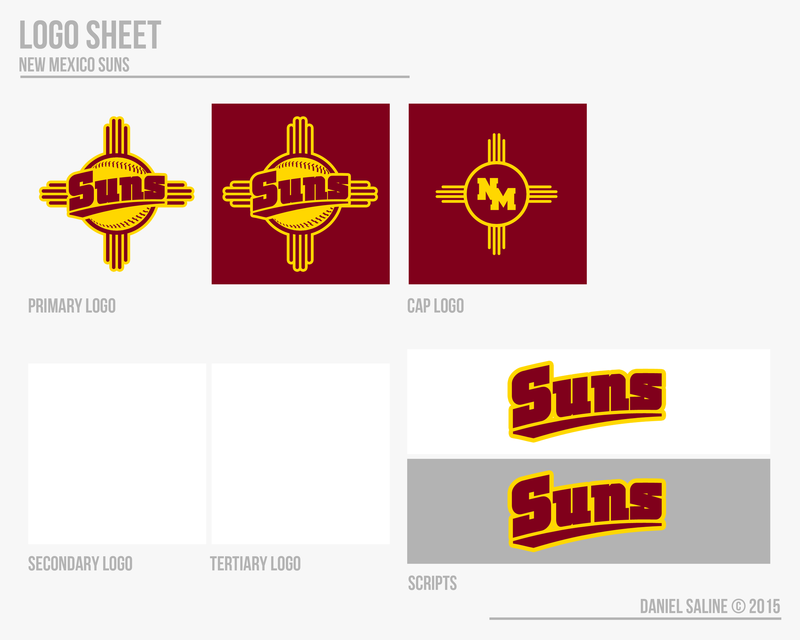 The nickname Suns and the logos are all based off of the traditional flag of New Mexico, making for a strong identity. The thick, multi-striped sleeve piping is meant to go along with this as well. The primary logo is only used on merchandise, while the NM cap logo is placed on the left sleeve as a patch. 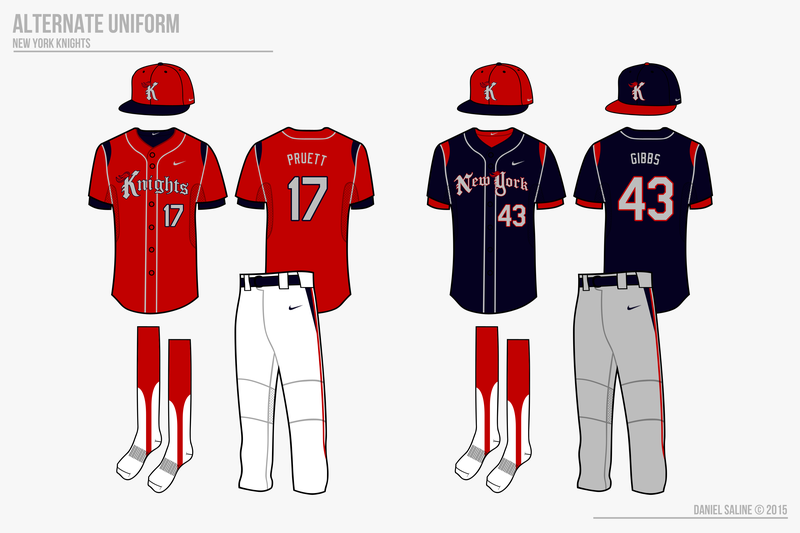 The white vested alternate is worn on Saturday afternoon home games and the red top is worn by the choice of the starting pitcher. The Suns keep it simple, but their look is unique enough to put them towards the top of the league. The Cap logo for Albuquerque is absolutely sweet! Being a native New Mexican, that is very, very cool for me. Keep it up! These are very nice. Yes, I really appreciate things like these. I love hearing if an identity fits the area and the culture of a city, but I also appreciate hearing if I'm off base and making generalizations. Glad to hear it hits home! Beautiful job on New Mexico. The look definitely captures the essence of New Mexico and the imagery of the flag. 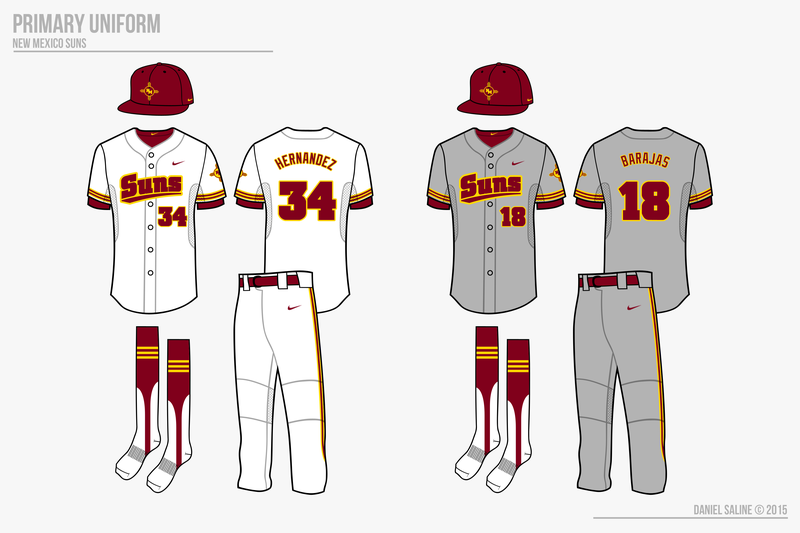 The "Suns" script is nice, and I love the sleeve striping on the non-vests. My only suggestion would be to use a thinner weight for the numbers. They're a little hard to read as is. 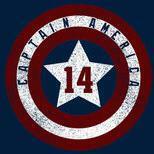 Regarding the cap logo, it is very very cool to see that logo on it! I am also a native New Mexican and I would absolutely love to see that logo on some of the local teams here. The issue is that the Zia Pueblo owns the symbol, which is why it's not currently in use by any teams - college, minors, etc. But I love the symbol, and I always wanted to see it on a football helmet, or a baseball hat. So seeing it here is thrilling, the look exceeded my hopes for it. Besides that, the color scheme is fantastic, the field is excellent, and the presentation is wonderful. No complaints here, keep up the good work! Favourite Logos:Original Mighty Ducks of Anaheim, FC Barcelona, Central Arkansas Bears, many others! very nice! 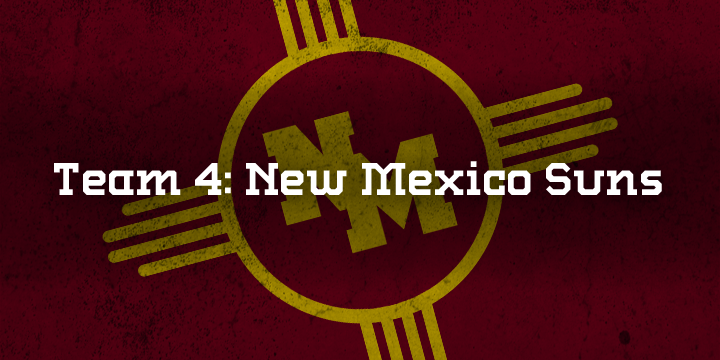 I liked how it went with all things related to New Mexico! To my knowledge they've always owned it. I don't know how the symbol got its use on the state flag but I think they were a part of that discussion. And actually I just read recently that the Eastern New Mexico University women's volleyball team was called the Zias and used the Zia symbol as their logo up until a few years ago and dropped the logo and the name out of respect to the tribe. As far as I know that's the last sports team to use that. And maybe you could do that! I think it also might be interesting if you said the tribe was a part of management/ownership. That could create a really interesting local tie. I like the ownership piece. I may even rename the stadium after the tribe as well. Any more comments for the Suns before New York is up? Looks amazing! Great work! The tie into the local history is great. Keep up the good work! 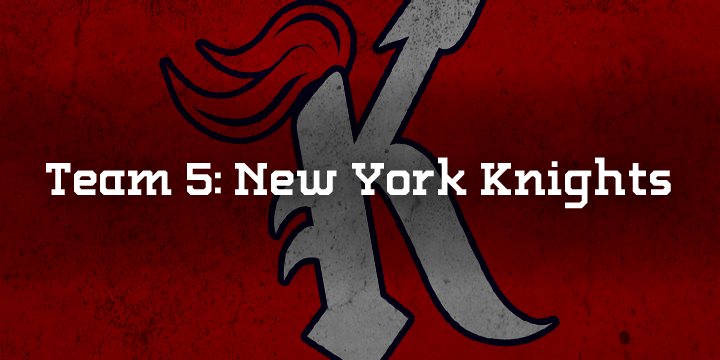 The Knights of New York are one of the most respected franchises in all of baseball, partly because of their storied history. They were established in 1930 when the USBL was initially created along with Boston, and the two clubs immediately became bitter rivals. The Great Depression hit the USBL hard, and the start of a second world war didn’t make things any easier on the league. The Knights combined with Boston during WWII, even as bitter rivals, because they valued the success of the league over the hatred in a rivalry. Former owner and leader of the consolidation Maynard Goldman entered the Hall of Fame in 1958. Although he has not reached the playoffs in 8 seasons, the potent bats and late-season surges have kept coach Bart Malfore in office. The 3-4-5 combination of Barney Walkers, Marshall Bennett and Ted Pruett has a .308 average since 2010, the best trio in the USBL since that seaon. The team certainly has potential, but the lack of consistency keeps them out of further contention. 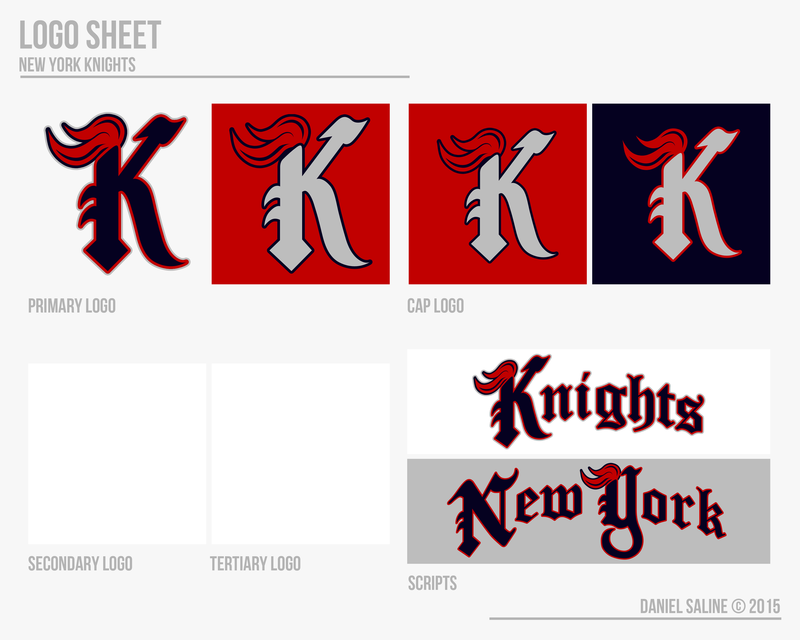 The K-plume cap logo concept has been a staple of the Knights’ identity since 1949. The red cap was added in the late 1970s, but was so well received that it eventually became the primary. The old English font has remained as a tribute to the 1933 champions, who had a similar look at the time. 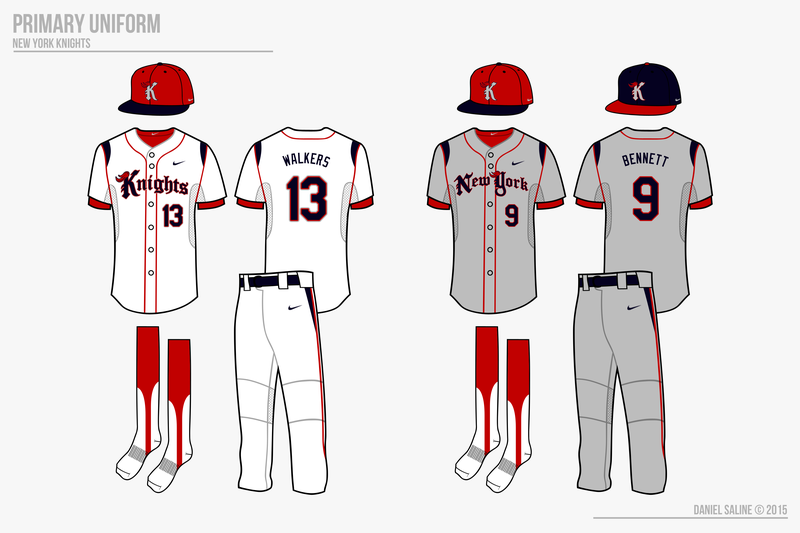 The set is a perfect example of a modern uniform but with enough traditional elements to please all parties in Queens. Goliath National Bank Ballpark was newly constructed in 2009 and has been altered numerous times in order to aid the struggling pitching staff. As more southpaws come through New York, the left field wall was pushed out with hopes of less homeruns to visitors. 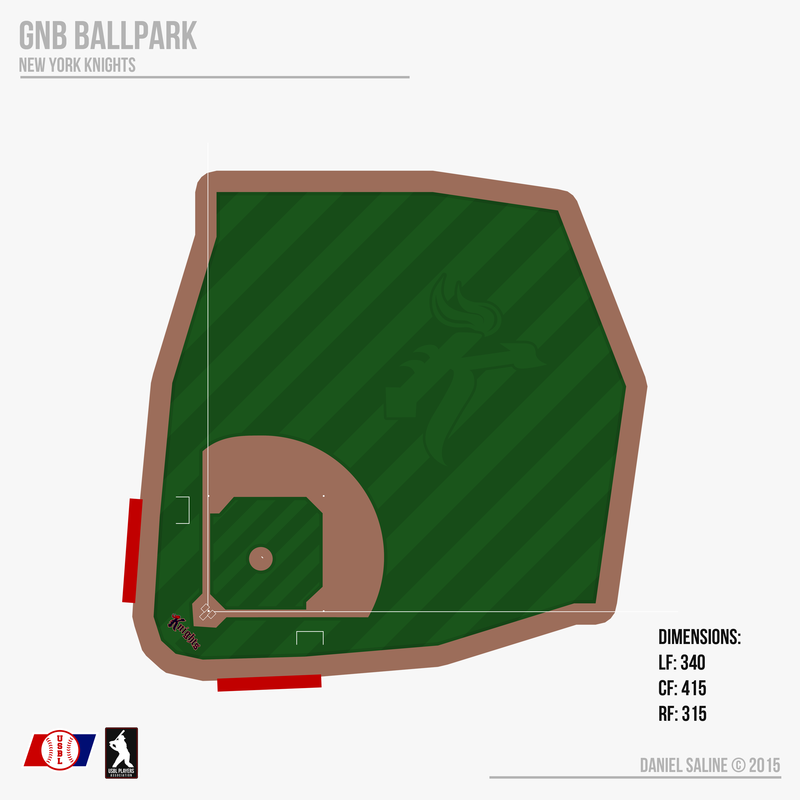 Despite the changes to the field, GNB Ballpark is still considered one of the finer parks in the league because of the classic brick architecture, reminiscent of the old Knights Colliseum. Location:Outside the universe; I know, mind blowing right. I really like how you put the team's logo mowed into the outfield. 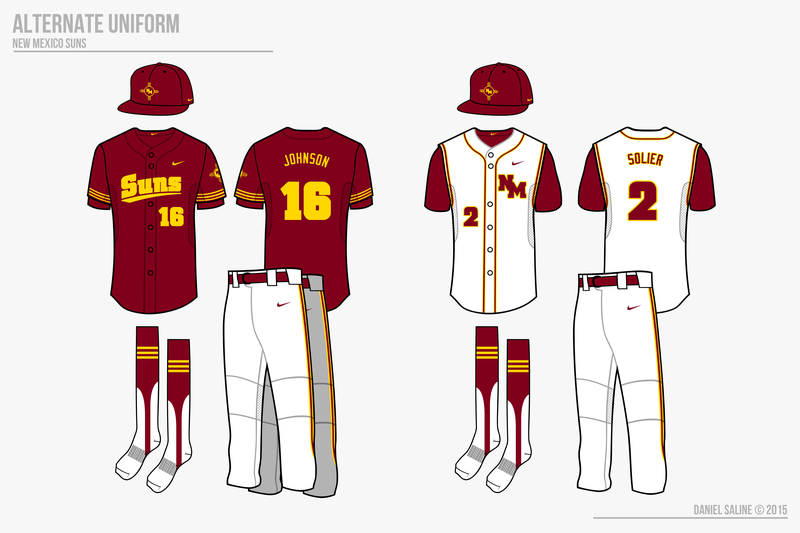 These all look really good, Iowa is my favorite. Really love what you have going on with the Knights. The plumed K is a really nice and recognizable logo, and the Old English wordmarks look surprisingly good--old English can be hard to pull off. I really like the jersey design too. I've never seen anything like it, but it looks really good. I also like the plume . Good work. I'm excited to see the rest of your teams! Also I apologize for those of you in phone, I copy and paste team descriptions from Google Docs so that's why the formatting is all messed up for you.